My sister Carol had Down’s syndrome. As a little boy, I would fantasize about becoming a doctor and being able to transform Carol into a normal person; but as I grew older I understood that my hopes for Carol were only a dream. Over the years I tried to be a dutiful brother, especially after my parents passed away. When my own children were of age, I explained Carol’s situation to them and they were always warm and accepting of their aunt, who always had a sweet smile for them whenever she saw them. I often reminded my kids of how fortunate they were to possess a normal intellect, with the potential to learn so much knowledge. Why things happen is ultimately unknowable, and we need to reflect that there but for the grace of God go I. 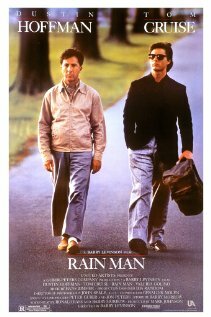 Rain Man tells the story of two siblings, Charlie Babbitt who is normal, and Raymond Babbitt, an autistic “savant,” who has been institutionalized. Charlie is very self-absorbed, immersed in a world of money and materialism. When Charlie learns that his estranged father has died, he travels to Cincinnati for the funeral and to settle the estate. There he learns that all he will receive from the estate is a classic Buick Roadmaster, while an undisclosed beneficiary will inherit three million dollars. The beneficiary turns out to be the mental institution where his brother Raymond lives, a brother of whose existence Charlie was never aware. Charlie kidnaps Raymond from the institution in the hope of forcing the trustee of the funds to make a settlement with Charlie for half the inheritance. Thus begins their cross-country trip together. In the course of their trip, Charlie observes Raymond’s fixation on ritual as a calming mechanism in the face of change. Raymond must watch certain TV programs, he must go to bed by 11 PM, and he must have pancakes for breakfast on specific days. At first Charlie thinks this is a massive charade and feels he can correct Raymond’s behavior. Over the course of their journey, however, he learns that Raymond’s autism is not subject to a quick fix. His routines provide stability, and any deviation potentially creates chaos for him and those around him. For example, Raymond refuses to fly on an airline unless it is Quantas, which has a zero crash record. The problem is that Quantas does not fly from Cincinnati to Los Angeles. This is the catalyst for the car trip across America, a shared experience that bonds the two brothers together, ultimately resulting in Charlie’s recognition that, in spite of his brotherly love, the people and the institution in which Raymond lives are best equipped to care for him. As a young rabbi, I remember my own naïve arrogance when I thought that I could fix all problems. In retrospect, I realize the delusion of my youth. It was not until years later and encounters with people in the real world that I understood that there are occasions when I did not have all the answers and that I had to call a professional for guidance. Perhaps one of the lessons we learn from people with disabilities of all types is to be appreciative and grateful for our own normality. In fact, I told my children that when we see people with a visible abnormal appearance, we recite a blessing: “Blessed are You, God of the Universe, who makes creatures different.” It could be that the Sages who formulated this blessing wanted to convey the message that all humans, no matter what their intellect or appearance, are creations of God imbued with an essential sanctity and infinite value. Rain Man reminds us of this truth. Posted in Drama, Movie review. Bookmark the permalink. Not very comfortable with that Bracha. I think you might be over-gracious to Chazal in your interpretation.